Elected officials, community leaders and residents gathered for the “Juan Rodríguez” co-naming ceremony. Four score and three hundred and twenty years ago, a man came to this country and settled on the northern tip of Manhattan. Only it wasn’t a country yet, or even a city. What is notable, however, is the fact that his 1613 arrival makes Juan Rodríguez the first recorded non-native resident of Inwood, Manhattan, and all of New York City. Rodríguez came on a boat—bypassing customs, quarantine, and Ellis Island. It is likely that Rodríguez was an interpreter who worked on a Dutch trading ship. In historic Dutch documents, Rodríguez is described as a mulatto man who lived on the island of Hispaniola, and it is known that he spent time in Santo Domingo, in what is the present day Dominican Republic, making Juan Rodríguez the first Dominican immigrant to New York City. 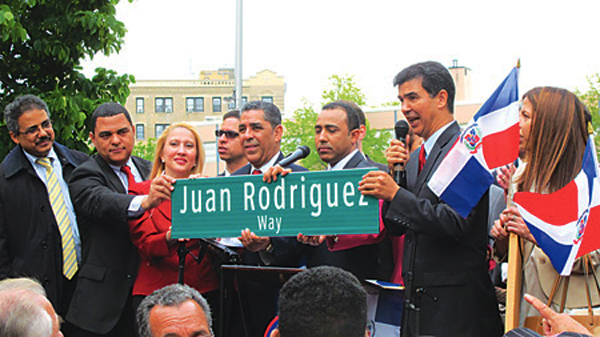 400 years after the fact, Rodríguez was honored with the co-naming of a stretch of Broadway from 159th Street to 218th Street in his name. Read more: First New Yorker back on Broadway.